STUDENT RESIDENCE 13 Men who have University residence hall contracts are expected to honor such contracts. Both the Interfraternity and Panhellenic Councils mail rushing information to students who indicate an interest in membership. 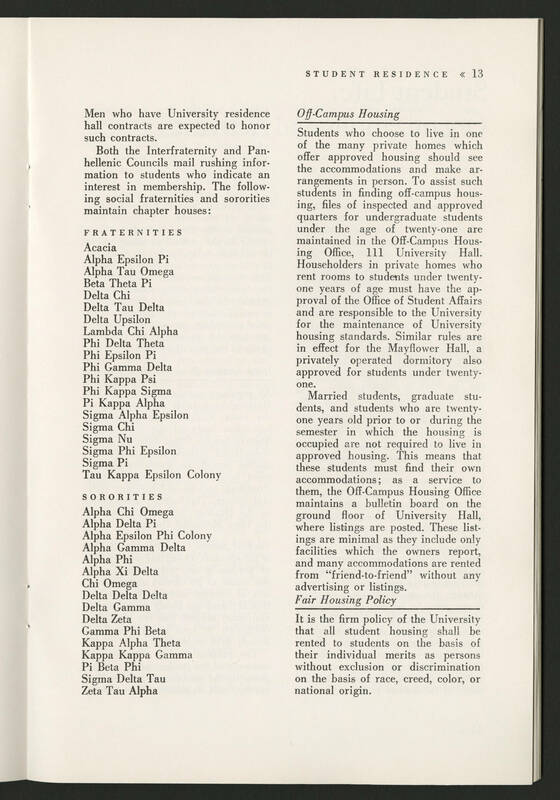 The following social fraternities and sororities maintain chapter houses: FRATERNITIES Acacia Alpha Epsilon Pi Alpha Tau Omega Beta Theta Pi Delta Chi Delta Tau Delta Delta Upsilon Lambda Chi Alpha Phi Delta Theta Phi Epsilon Pi Phi Gamma Delta Phi Kappa Psi Phi Kappa Sigma Pi Kappa Alpha Sigma Alpha Epsilon Sigma Chi Sigma NU Sigma Phi Epsilon Sigma Pi Tau Kappa Epsilon Colony SORORITIES Alpha Chi Omega Alpha Delta Pi Alpha Epsilon Phi Colony Alpha Gamma Delta Alpha Phi Alpha Xi Delta Chi Omega Delta Delta Delta Delta Gamma Delta Zeta Gamma Phi Beta Kappa Alpha Theta Kappa Kappa Gamma Pi Beta Phi Sigma Delta Tau Zeta Tau Alpha Off-Campus Housing Students who choose to live in one of the many private homes which offer approved housing should see the accomodations and make arrangements in person. To assist such students in finding off-campus housing, files of inspected and approved quarters for undergraduate students under the age of twenty one are maintained in the Off-campus Housing Office, 111 University Hall. Householders in private homes who rent rooms to student under twenty one years of age must have approval of the Office of Student Affairs and are responsible to the University for the maintenance of University housing standards. Similar rules are in effect for the Mayflower Hall, a privately operated dormitory also approved for students under twenty one. Married students, graduate students, and students who are twenty one years old prior to or during the semester in which the housing is occupied are not required to live in approved housing. This means that these students must find their own accomodations; as a service to them, the Off-Campus Housing Office maintains a bulletin board on the ground floor of University Hall, where listings are posted. These listings are minimal as they include only facilities which the owners report, and many accomodations are rented from "friend-to-friend" without any advertising or listings. Fair Housing Policy It is the firm policy of the University that all student housing shall be rented to students on the basis of their individual merits as persons without exclusion or discrimination on the basis of race, creed, color, or national origin.